Greetings everyone, hope you are having a good and Godly day, for of what lasting value is a good day if it isn't also a Godly day. 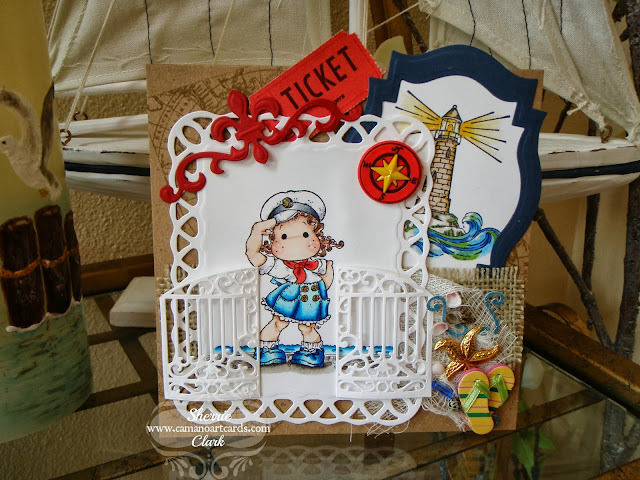 I have a couple of fellow crafters (Robin and Phyllis) who are leaving for Hawaii in the next few days so I thought I would send them off with a Bon Voyage with a "Ticket to Paradise". I really hope you both have a fun trip and we'll look forward to seeing pictures and hearing your stories upon your return. This card also reminds me of my free ticket to heaven. If you know the Lord, you can receive one of these too. Don't miss out on the most beautiful place we've ever seen as it will be far greater and more beautiful than our present earth with no more sin. Isn't that a wonderful thought!! Don't miss heaven, ask Jesus to become Lord of our Life today. Today I decided to include two photos of this card at different angles. I often make my cards like a easel (see bottom photo). By adding a cardboard back with a fold about one inch down from the top with only the top inch attached to the card it sits up stronger and is less apt to fall over. That's why I call them "Art Cards" so the recipient can place them on a table to enjoy instead of being hidden away in a drawer somewhere. They can also be framed and hung up on a wall to be appreciated for years to come. The card recipe is a 6x6 kraft paper base stamped with a nautical stamp I had. 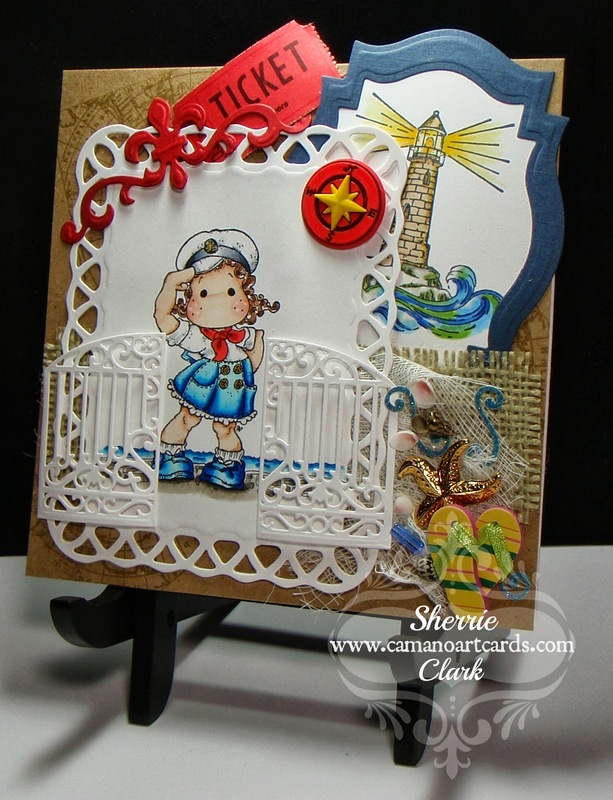 The lighthouse frame is cut using Spellbinders Labels 18 with the edges embossed. I usually just use my stylus on the back of the cut out and press around the edges to make the raised impression. You can also run it through your cutting machine again if you have the correct sandwich. The lighthouse is a stamp I've had for years and the Magnolia stamped image is from the Sea Breeze Collection called "Salute Tilda". Both are colored with copic markers and the die around Tilda is from Spellbinders called Lattice Rectangles. In front of Tilda I used part of a die from Spellbinders called Gilded Gate 2. There is one additional die in red in the upper left corner called Spellbinders Fleur de Lis Motifs. You'll notice a piece of cut burlap, shells, compass, flip flops, ticket (colored red with copics), beads, starfish earring, and some blue sparkly swirly things from a border punch I have. These are just lots of trinkets I have collected over the years in my ventures to different thrift stores. Thanks for dropping by. Baskets of Blessings. Stamps: Magnoila: Sea Breeze Collection "Salute Tilda"
Accessories: Spellbinders: Labels 18, Lattice Rectangles, Gilded Gate 2, and Fleur de Lis Motifs. Good morning dear bestie...this card is not only darling [I love the boat in the background] but your sweet invitation to JESUS makes it glow all over. How I love your faithfulness and He does also! Your attention to detail adds a delightful dimension to this card...which your friends will love receiving. Again...you bless me!! Thank you Bestie in Jesus, I appreciate you and your encouraging comments on all my cards. Blessings in Christ!! 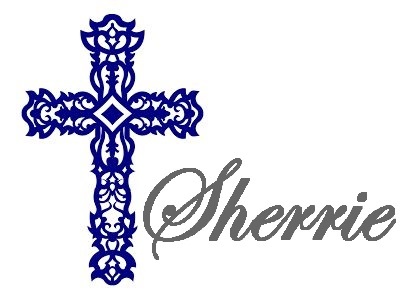 Hi Sherrie! Oh your card is just adorable and full of such fun details!!! I love the flip flops and starfish tucked in down in the corner! Your coloring is just amazing!!! Love how you give God the glory in each post! 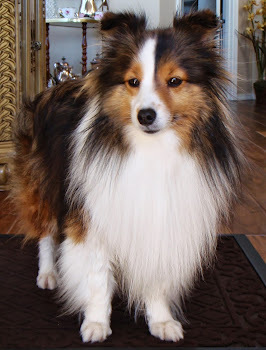 Grace, what an honor to have you stop by my blog and thank you for the encouraging words. 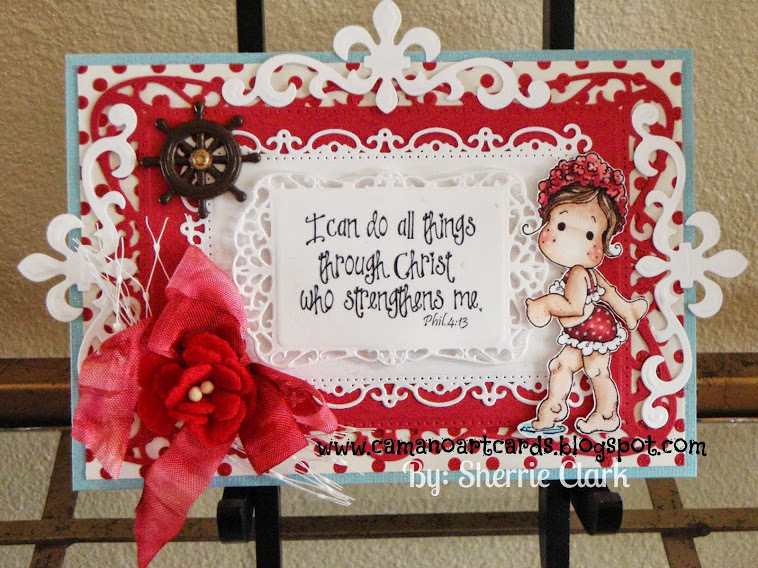 I enjoy the beautiful cards created by you at: (http://th-ink-ingofyou.blogspot.com/) and how they glorify the Lord too. Blessings in Christ.